Selling your house - then moving to a new home or other accommodation can be very stressful for everyone - for you and your family members. There are seemingly a million things to think about, from making the decision to sell in the first place - all the way to changing your postal address when you move to your new location. But down-sizing, moving to a new suburb, looking for a sea-change, a vine-change, or moving to that retirement apartment or village doesn't have to be hard. It just requires the right helping-hand. 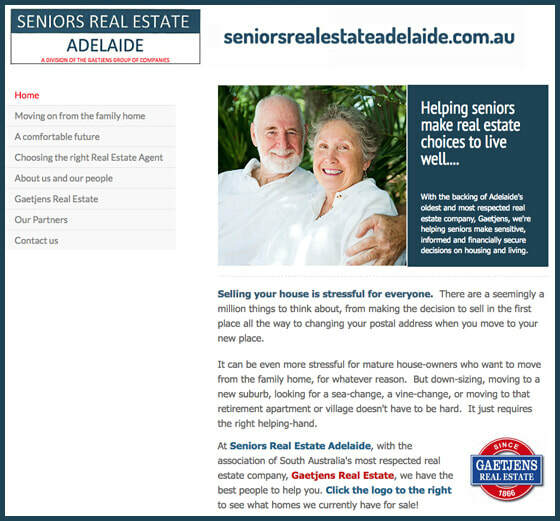 As South Australia's oldest Real Estate company, we've helped many of our long-time clients through this process - some clients who bought their first house with us have transitioned over the years to new homes - and are now looking for new accommodation to suit their retirement years. We can help you make this transition - and to explain what we can do, we've made a separate website to guide you. To see it, CLICK ON THE IMAGE AT LEFT. That will take you direct to our Seniors' site. Have a look, then contact us!